Mexico City does not have a lot of free land. It also has a quite a few height limits – no building can be over eight floors tall. So, Esteban Suarez, co-founder of BNKR Arquitectura had this idea. They couldn’t go up, so they decided to go down instead. That is what the ‘Earthscraper’ is about. When it comes to the shape of the building, there’s nothing that special. It is only a pyramid, after all. Albeit, an upside-ddown, underground pyramid. 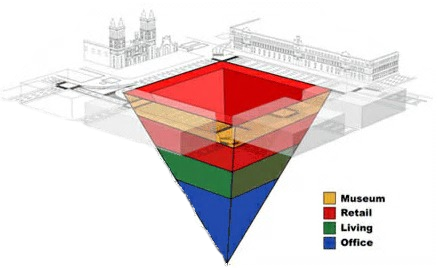 The base of the pyramid is the highest part. It will be the surface. The structure is to be built under the city’s central plaza. The first ten floors are to be a museum dedicated to the city’s history and its artifacts while the next twenty floors are to be divided between retail and housing. The bottom half of thirty five floors will be office space – a total of 65 floors underneath. 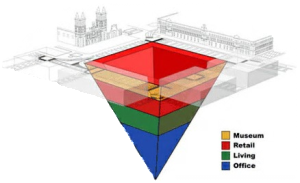 The inverted pyramid will have a central void to allow for some much needed natural light and ventilation. There will be plants and trees in ‘earth lobbies’ which have the purpose of improving air quality. Renewable energy could be generated by a turbine powered from collected groundwater – its green, too. It may even have its own metro station so that the plaza doesn’t get too crowded and the underground metro system might pass through it. 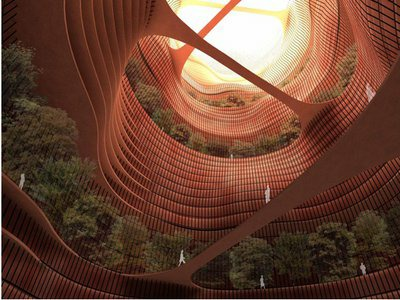 This is an idea that could truly revolutionize architecture and it might even redefine the term ‘tall’. For all we know, a whole ‘Earthline’ will exist soon.